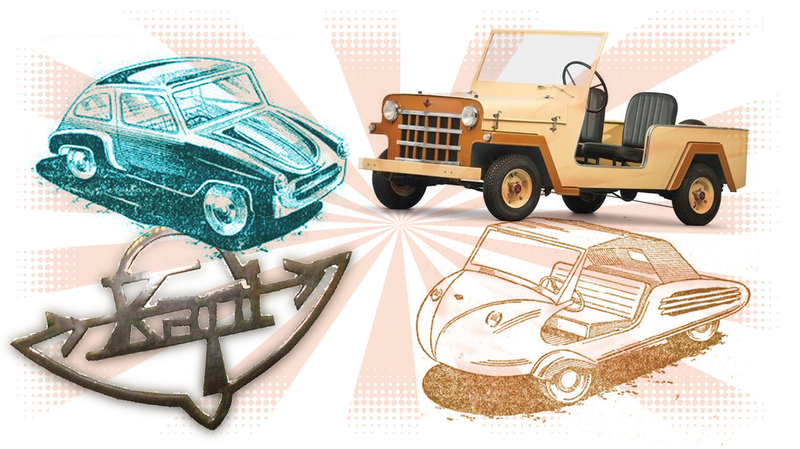 If you had to imagine the ideal lineup for a car company, I suspect that most of you would come up with something like this: a tiny three-wheeled microcar called “the flying saucer,” a tiny knockoff Jeep, another microcar with four wheels, a Mercedes 190 SL knockoff, and a bizarrely misshapen sedan. Right? If that’s your list, then get ready to be delighted, because that’s pretty much what Kapi built. A lot of details about the company, such as just how many cars were actually produced, are pretty murky, with the numbers ranging from 70 to 300 or more. What is clear, though, is that the cars this tiny company made were kind of fascinating, and they were real pioneers in the then-nascent art of blatant, unlicensed knockoffs of well-known cars, presaging the sorts of things that still happen in the Chinese motor industry. The Flying Saucer was a three-wheel microcar with the single wheel up front, an evolution of an earlier Kapi three-wheeler known as the Kapiscooter. The Flying Saucer redesign of the Kapiscooter was pretty dramatic; the small 8.5 horsepower single-cylinder motorcycle engine was made by Villers and seems to have been housed in the right-side rear fender pod. Everything was much more sort-of-streamlined and refined looking compared to the earlier ones, and there were even cargo versions and convertibles built. Allegedly, these things could go 60 mph and make 100 mpg! I bet 60 mph in one of these was nice and terrifying. The Jip is amazing because it might be the first real, willful knockoff of a car, right down to the name. The Jip, as you can likely guess, is a tiny version of the iconic Willys Jeep, and even has a grille design reminiscent of the Willys-Overland Jeepster version of the civilian Jeep. Mechanically, the Jip was very similar to the other four-wheeled microcars Kapi was building, and had a 197cc Hispano-Villers one-cylinder two-stroke engine, making 8.5 hp. While most were open-topped, at least one hardtop version seems to have been made, a dead ringer for a shrunken Willys Jeep Station Wagon. While there were license-built Jeeps around the world and many very Jeep-like knockoffs starting to happen around this period, the use of the similar name and the disregard for making something mechanically comparable make Kapi a pioneer in this sort of true automotive knockoffery, if you ask me. This was a pretty delightful-looking four-wheeler (it looks like three, but there seem to have neen two wheels in the back there), with styling that perhaps was influenced by Volkswagen’s Type 2 buses? That large triangular, two-tone nose motif is quite similar, though it’s arguably also just a style of the era. The Chiqui had a 200cc engine, offering an opulent 3cc more than the Jip, though actual performance was likely pretty similar. The Chiqui seems to have had a removable hardtop as well, which is unusually nice for a cheap microcar of its type. This was the first fully-enclosed, four-seat Kapi, and as such was deemed to be the “luxury” version. What’s most notable about the car, though, is its absolutely bizarre styling: the thing looks like it’s melted. ...but in reality it’s hard to think of a stranger-looking car. The rear looks like it’s getting sucked into some sort of unseen yet colossal vacuum cleaner. It’s amazing. I feel like Kapi is an under-appreciated and very strange gem in the automotive world. At the very least, those gleefully blatant Chinese knockoff car-makers should give some respect to the little Spanish company that pioneered it all.